Zybez RuneScape Community was shut down on September 17th, 2018. You're viewing an archive of this page from 2018-12-05 at 03:38. Thank you all for your support! Please get in touch via the Curse help desk if you need any support using this archive. The final stretch approaches. I don't think I have posted my 2400 total screenie (even though I have one)... that one slipped from my mind. Surprising for you and me, I managed to reach 2500 total levels without a single maxed skill. Cheers! Psst... I tried to pick a place that looked cool. Edited by Ninjasteak, 02 March 2014 - 10:20 PM. 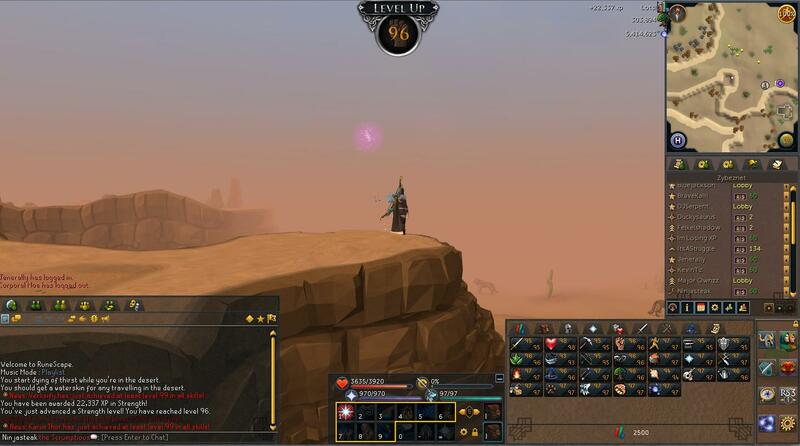 Are you aiming to try and get a lot of your skills to 98 and get them all to 99 in one go? It looks like you definitely will be getting 99 constitution soon if you touch anymore of your combat skills though. Congratulations though Ninja on 2500 overall, keep it up! Thanks bactine!! I'm sure you know... that skill is the most wicked kind of evil. I bet I'll find somewhere even more epic next time.